Hi everyone. For the last few months I have been preparing for an upcoming trip to Iceland, in June, and working to hone in on the exact combination of gear to take. In anticipation of the trip I added a Sony a7RII to the kit and will be taking this along with my Fuji X-T2 and X-Pro 2 cameras. Hauling around two different camera systems is not a new concept for me, having shot Sony and Nikon at the same time, but it did present me with a lens dilemma that needed some resolution. I have become quite enamored of my Fuji System, especially the prime lenses, and wanted to try and emulate that as much a possible for the Sony. But therein lies the problem as the prime line-up for Sony is not as fully developed in the e-mount unless you opt for the expensive Zeiss Batis and Loxia lenses. Fine lenses without a doubt, but I was looking for a more economical solution especially in the wider focal lengths. I am an incessant researcher and one evening during my travels through the internet I came across the FiRIN 20mm f2 MF, a new e-mount specific offering from Tokina. I was instantly intrigued. It was interesting to me that Tokina would have developed a 20mm as their first lens for the e-mount, but I was not going to argue that point. A 20mm hits a perfect sweet spot for me, the other being my ultra-wide Voigtlander 15mm Heliar III, and I knew this lens just might be the perfect solution that marries high quality optics with a reasonable price. Now, let me get the disclaimers out of the way. I am not currently a Tokina Ambassador nor was I paid to write this post. All of the gear I write about, or cite in my posts, is gear that I actually use in the coarse of my photography work. Secondly, if you are looking for a lot of images of brick walls, books on a shelf, and all that other pixel-peeping nonsense than this post is probably not for you. A lens test for me is shooting with it, and in the same conditions and light that I will typically make images - in this case that happens to be low light landscape shots. I am interested in a couple of things with the lenses I use. Sharpness of course, but that can be somewhat subjective I think, but more importantly I am interested in the micro-contrast which ultimately aids in the resolving of fine details. Color rendering of the lens, build quality, and ease of use all play an important role, but resolution of detail is a big plus, as much of my work centers around fine detailed subject matter, such as the landscape images in this post. The FiRIN 20 is not too big, or too small. I would say it is just about right and balances quite nicely on the Sony A7RII. The lens is well built and features a matte finish with printed numbers on the aperture ring and the distance scale. The above images gives you a sense of scale against my diminutive Voigtlander 15mm Heliar III (left), and the Contax Zeiss 35-70mm (right). The lens comes supplied with a handsome, retro-styled rectangular hood. The lens has what I might label as a modern-retro look. Certainly not as retro looking as the Voigtlander and perhaps a tiny bit more modern looking than the Contax. The FiRIN is the first in a series of mirrorless lenses and represents Tokina's move towards full-frame compatibility on the Sony a7 series of camera bodies. I won't go into all of the specifications, as you can read all about it on the Tokina Website, but the lens is designed with aspherical lens elements placed to reduce optical aberrations and includes super-low dispersion glass to all but eliminate chromatic aberrations - and all of this housed in a high-precision, machined metal barrel. The lens is chipped and will translate shooting data when imported into Lightroom and works with the Sony's MF Assist functions including Focus Peaking, the Distance Scale, and Image Stabilization. At a maximum aperture of f2.0 it will prove to be a nice low-light lens and should perform very well for astro-photography. I applaud Tokina for placing the Aperture Ring at the front of the lens. I enjoy this feature on my Voigtlander 15mm and the ergonomic consideration makes the aperture ring much easier to access and change without impacting critical focus functions. The Aperture Ring also features a DeClick button for video and cinema use. This is an manual focus lens. No auto focus here and that makes me a pretty happy camper. For the majority of landscape I work I do a manual focus lens is my preferred choice and in fact I do not own a single AF lens for my Sony System. Of course I do not have any issues with AF lenses (I have several for my Fuji System), but I am biased to a more "old-school" way of shooting and that includes shooting in manual mode and with predominantly manual prime lenses. The focus mechanism is very smooth, well damped, with a nice tension-feel, and the lens responds well to dialing in critical focus. All of the images below were shot with the FiRIN 20mm on a recent trip to one of my favorite waterfall locations. The combination of shooting in lower-light conditions along with extreme variance of contrast, and super-fine detail would be a good test for the lens. I was not disappointed. In some earlier tests I discovered the lens' ability to render fine micro-contrast detail. Blades of grass and other fine detail just seem to resolve nicely. This is due in no small part to the lens design and multiple coatings that reduce flare and aberrations while increasing sharpness and micro-contrast. Flare in fact is handled extremely well and the nine aperture blades produces a beautiful sunstar. The filter ring is 62mm and I used my HiTech adapters and 100mm Singh-Ray 105mm CPL, and 100mm x 150mm ND Filters easily and without fear of vignetting. And speaking of vignetting it is very well handled even shooting wide open. Once stopped down beyond f4 it is non-existent and in any event is easily corrected in Lightroom. Additionally I found chromatic aberrations well handled by the lens and was hard pressed to find any in the high contrast areas of the shots. As I mentioned all of these images were shot with the FiRIN and coupled with the 42mp Sony Sensor the results were outstanding. I found finding critical focus easy and in fact dialing the lens back just a hair from the Infinity Symbol gave me the zone I needed for the image. The sweet spot for my work was anything between f8 and f11. I never ventured beyond that and only in one instance did I need to make a focus bracket as I brought the lens tight to one of the big boulders. The color rendering is quite nice, if not slightly towards the cooler side but easily adjusted in Lightroom. The lens is not heavy, at 1.1 pounds, but not as light as my Voigtlander. But it balances quite well on the Sony body and the entire package has an aesthetic appeal. As to my shooting process, all the images were captured in RAW, 14 bit uncompressed. Each file was developed individually in Lightroom before import into Photoshop for final work. The black and white images were converted in Lightroom and split-toned in the highlights and shadows for a more balanced feel. While shooting I used a Singh-Ray 105mm CPL, and in some instances a 3-Stop ND, to balance out the specular highlights and to control the time. For a more detailed look please Click on any image to view it in Lightbox Mode. The Lower Falls - ISO 100 at f11 for 2 seconds. The Slot in the Lower Falls - ISO 100 at f11 for 2 seconds. The Upper Reaches - ISO 100 at f11 for 2.5 seconds. The Slot in the Lower Falls - ISO 100 at f8 for 1.5 seconds. The Lower Falls - Black and White Variation - ISO 100 at f11 for 2 seconds. 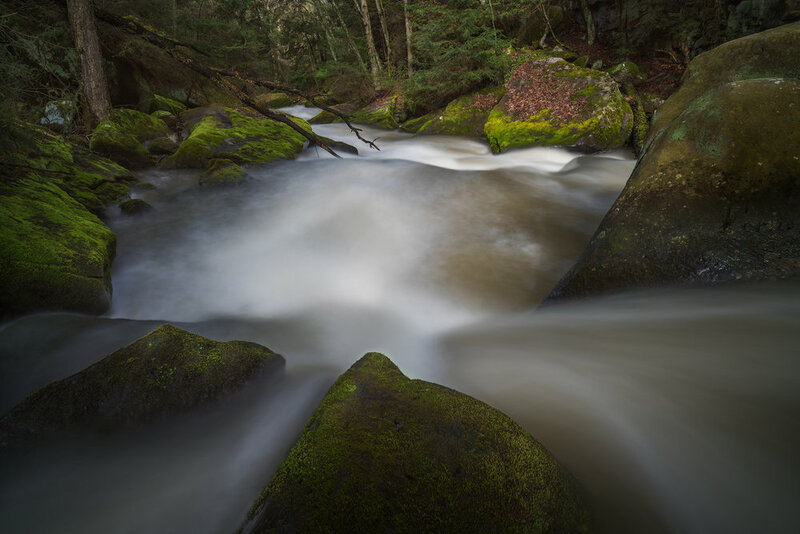 The Boulder Field at the Upper Falls - ISO 100 at f11 for 5 seconds. The Slide - ISO 100 at f11 for 1 second. The Slide - Black and White Variation - ISO 100 at f11 for 1 second. The Forest View - ISO 100 at f11 for 4 seconds. The Lower Plunge Pool - ISO 100 at f11 for 4 seconds.